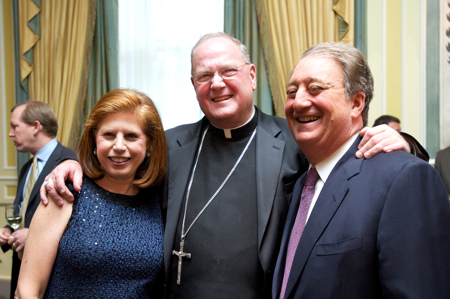 The Catholic Big Sisters and Big Brothers presented its Humanitarian Award to Howard Milstein at the organization’s annual spring gala. The gala was held at the Pierre Hotel in New York City. In introducing Howard Milstein and presenting the award, Terence S. Meehan, Chairman of Azimuth Investment Management, LLC, and friend of Catholic Big Sisters and Big Brothers, spoke of the history of Emigrant Savings Bank, of which Mr. Milstein is Chairman, President, and CEO: “I really do take a great deal of joy in introducing Howard Milstein. The Emigrant Bank was formed by the Irish Emigrant Society in 1850; it then became the main financier for St. Patrick’s Cathedral and the actual documents for that were signed in its office. The Emigrant continues to be the premier financier of most of the Catholic churches in New York City. Recently, Emigrant Bank was the sponsor for ‘Catholics In New York, 1808-1946’ at the Museum of the City of New York. And Howard acts as an advisor to the Archbishop and Cardinals. In accepting the Humanitarian Award, Howard Milstein said, “What a wonderful organization. . . just the idea of one person caring can make a huge difference in the life of a young person. And every person who you help goes on to be a wonderful addition to the world. As I think about what you do, we salute all the good works of Catholic Big Sisters and Big Brothers. The Catholic Big Sisters and Big Brothers (CBSBB) is a nonprofit, nonsectarian community-based organization serving New York City, dedicated to helping youth and their families. It supports the special needs of girls, boys and their families by providing comprehensive mentoring, counseling and skill-based programming free of charge.